Naw Rúz (also known as No Rouz, Nowruz, or Noruz), translates to "New Day" in English is the Bahá'í and Persian New Year, which occurs on the date of the vernal equinox. The holiday is fixed as March 21 for Bahá'ís in all countries outside the Middle East, regardless of exactly when the equinox occurs. However, those who celebrate this day culturally, rather than religiously, celebrate on the exact day of the equinox. Naw Rúz dates back approximately 3,000 years and is rooted in Zoroastrianism. Zoroastrianism is an ancient Persian religion the predates Christianity and Islam. Millions of people around the world celebrate this holiday. 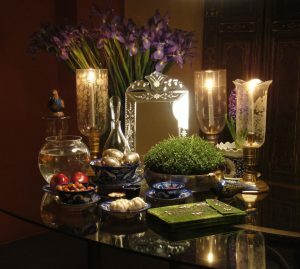 For Baha'i's, Naw Rúz is the first day of Farvardin, which is the first month of the Persian solar year. In the Badi` calendar of the Báb, Naw Rúz is the day of Baha of the month of Baha, a day called by the Báb `the Day of God' (yawmu'llah). It was also the `Day of the Point' (yawm-i-nuqtih) or the day of the Báb. Finally, it is also a day associated with Him Whom God shall make manifest, the Promised One of the Báb. The remaining eighteen days of the month of Farvardin were associated with the eighteen Letters of the Living. This indicates that the Báb envisioned the Naw Rúz festivities encompassing the nineteen days of the month of Baha, just as the traditional Persian Naw Rúz festivities last thirteen days. To prepare for the coming holiday, about three weeks prior, people start serious spring-cleaning; ridding their homes of unnecessary clutter and dirt. The idea behind this is to start fresh in the new year. Naw Rúz is celebrated similarly to Christian Easter, with many symbols indicating spring and renewal. A week or so before the holiday, lentils are placed in a dish to sprout into a mass of green blades. On the day of Naw Rúz, families gather in new or freshly cleaned clothes. Many people also include other symbolic objects such as holy book (of whichever faith they are a member), a mirror for reflection, colored eggs for fertility, and coins for prosperity. A great deal of time is spent with meetings for prayer and celebration. The celebrations end on the thirteenth day of Naw Rúz with a picnic. The sprouted lentils are thrown into running water, carrying away the bad luck of the previous year. Naw Rúz also has some specific food traditions. The centerpiece of most Naw Rúz meals will be an herbed rice served over a whitefish (sabzi polow ba mahi). You might also see kuku sabzi, which is eggs baked with lots of herbs such as dill, cilantro, fenugreek, parsley and tarragon; it is a bit similar to a fritatta. Naw Rúz is also one of the nine Bahá'í holy days on which work is supposed to be suspended. As with all Bahá'í holy days, there are few fixed rules for observing Naw Rúz. Many Bahá'ís also celebrate Naw Rúz with gift-giving. The fact that Naw Rúz also marks the end of the nineteen day Baha’i Fast, adds to the celebratory nature of the holiday where people enjoy each other’s company and welcome the exciting, unlimited possibilities of a new year. However, the holiday is not just for celebration. It also serves as a symbolic reminder of the oneness of all the messengers of God, and the spiritual springtime they each brought to humanity. Hola Mohalla is a Sikh holiday. 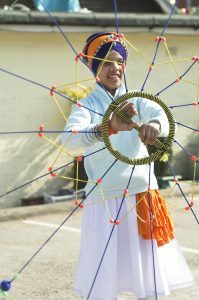 The words Hola Mohalla mean “the charge of an army.” The date Hola Mohalla varies from year to year, as the Sikh calendar is lunar cycle based. The holiday is held one day after Holi. Hola Mohalla was created by Guru Gobind Singh in 1669 to give Sikhs the opportunity to engage in military excercises, mock battles, athletic competitions, and literary contests. This festival was likely created to prevent or prepare for an armed struggle with imperial powers. It also served the purpose of channeling follower’s energy into a useful activity. For Sikhs in the United States, they might go to their temple, as they would for many other Sikh celebrations, and listen to the scripture being read or sung. Some temples celebrate this holiday by having martial arts demonstrations. Another way temples might celebrate is by having poetry contests. Some temples also have parades, as a peaceful way to show off their strength in numbers.